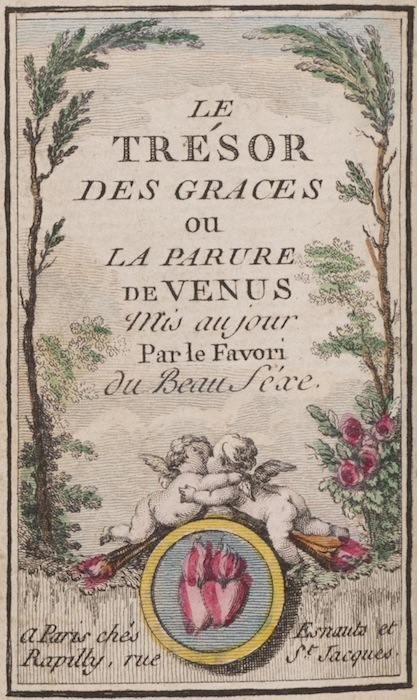 In spring 2016, students in Professor Hélène Bilis’ seminar FREN 303: “Long Live the Queen!”: Women, Royalty and Power in the Ancien Régime presented detailed readings of the hairstyles found in Le Trésor des Grâces, an almanac published in Paris in 1779 that bears on its cover the coat of arms of France’s most famous queen, Marie-Antoinette. The almanac is held in Wellesley College’s Special Collections. To prepare for their exploration of this artifact of 18th century publishing and aristocratic life in the ancien régime, students in the course had a guest lecture by Ruth Rogers, curator of Special Collections, who provided historical context for the almanac and the history of the book in the hand-press period. They then discussed their assigned coiffure with Laura O’Brien, research and instruction librarian, who provided support for their extensive research into diverse topics including hairstyles and fashion of the French court, theatrical performances, engraving, gaming, and book sales. To complete their research projects, student did a close reading, in French and English, of the engravings in the almanac, highlighting what Le Trésor’s readers should note in the colorful prints, and generating a carefully researched explanation of each coiffure, including supplemental images, footnotes, and links for further investigation. The essays were then assembled into an exhibit on the Scalar web publishing platform by Jenifer Bartle, manager of digital scholarship initiatives. Further details about the collaboration involved in this project can be found in this brief case study.